Today's guest blogger is my sister in law, Annie. All of my sisters in law are super talented and have a lot of creativity. Annie has a lot of different things she's talented in, and one of the reasons I like this project is because she is able to combine a couple of them together. It's always a pleasure to get one of her beautiful cards in the mail. The fact that it's handmade make them that more meaningful. This tutorial is perfect for this holiday season (or any occasion). I always just buy my cards for the most part, so this is a good thing for me to try to start doing. Plus, it's simple and easy to do, but let's the receiver know that you care. I hope everyone has a wonderful and merry Christmas! Hi everyone! It's a pleasure to be here as a guest blogger :). Joyce asked me if I'd consider writing a guest post at the end of the summer. 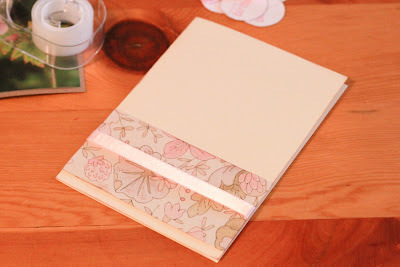 I just happened to be working on something at the time, so I documented it with photos. I apologize that it's not holiday themed being the first of December, but this project could definitely be adapted for the holidays. Admittedly, I only make cards a couple times of the year, and I make eight to ten of each so that I have some extras lying around when I need to send a quick note. I keep my cards pretty simple, but it's always nicer to have something homemade. I also love photography. As pretty flowers are particularly photogenic, I always end up having tons of great shots of flowers without anything to do with them. 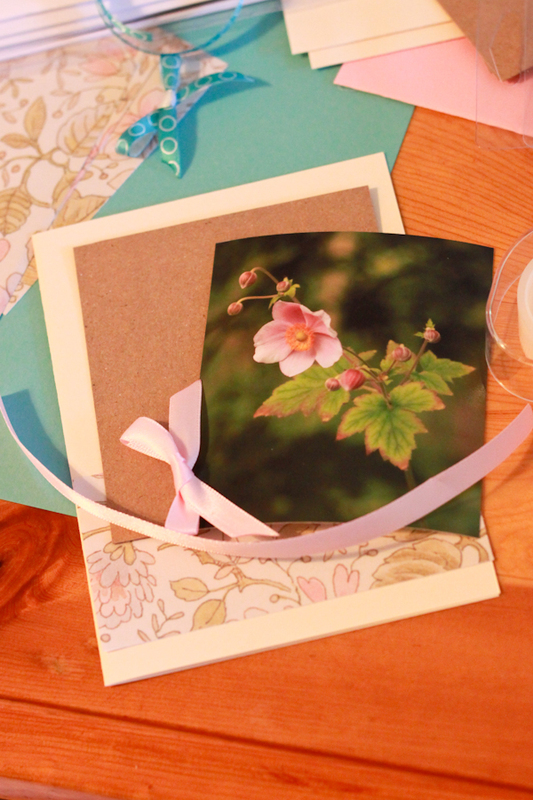 This year I started combining my card making with photography to use some of my favorite shots. 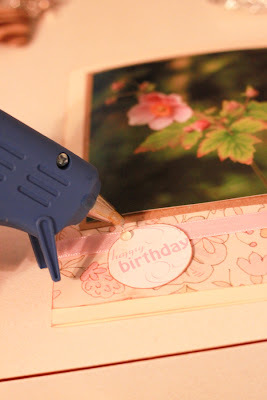 Here's a little tutorial for the latest batch of birthday cards I made. Your could easily turn these into something holiday appropriate by using a seasonal picture like pine cones, icicles, or even your family's photo. 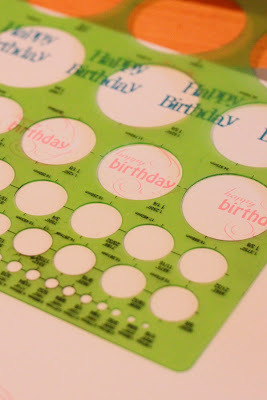 I created some birthday tags in Adobe Illustrator, but you could also do something similar with MS Word or other program. Once the tags are printed I use an Exacto knife around a circle template to get them the right size. 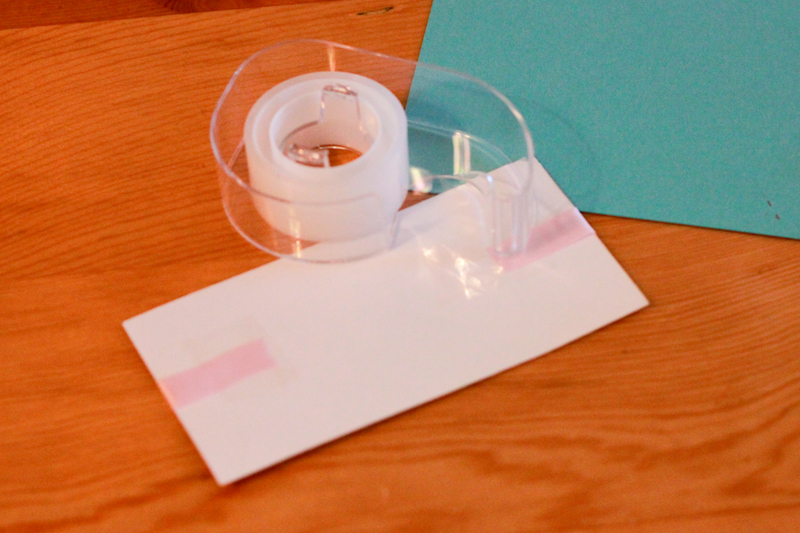 Wrap ribbon around patterned paper and tape (or glue) so that it wraps the length of the paper in the center. 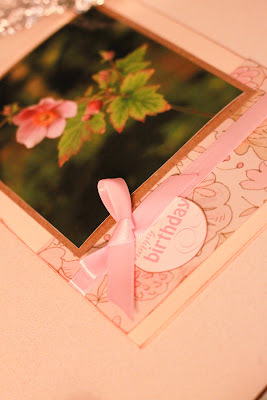 Tape (or glue) patterned paper with ribbon to card. 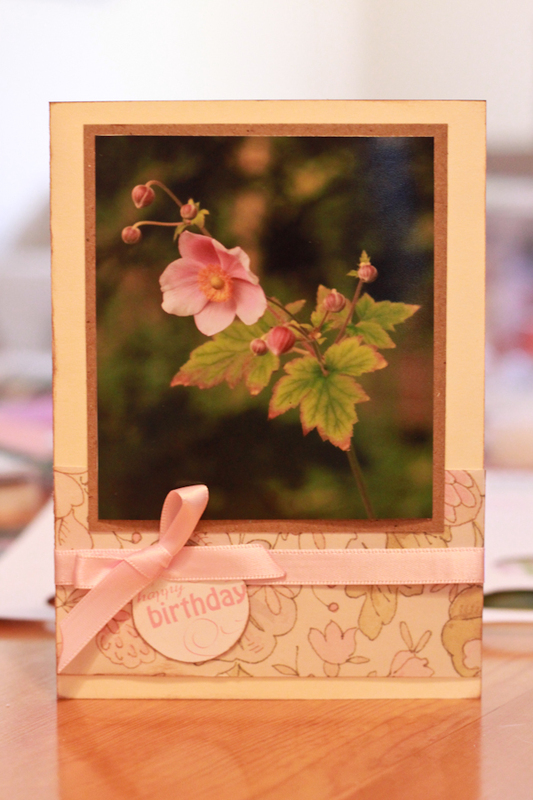 Glue photo to border paper and center (or not) on card, and glue. 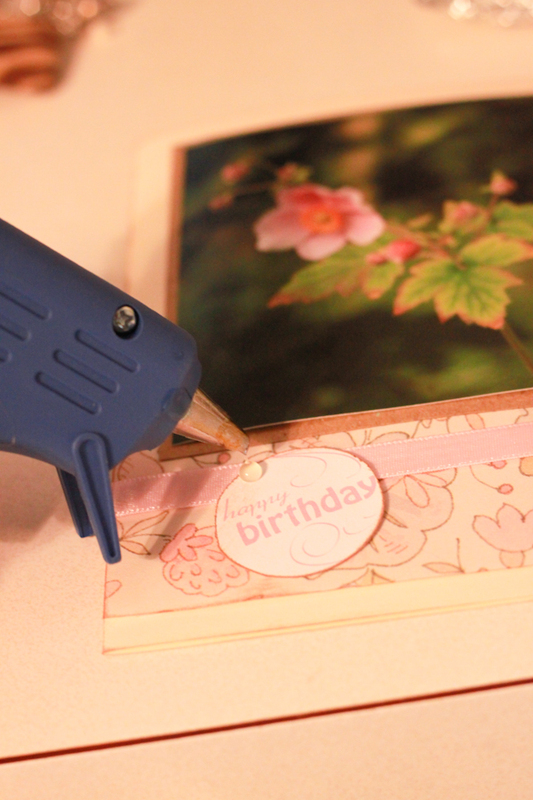 Here you could also use some foam tape, or dots to give the card some dimension. Using a hot glue gun I glue the tag down, then the bow on top of that. It'll look like this when the ribbon's down. Voila! You have your own personal photo card, easy peasy. 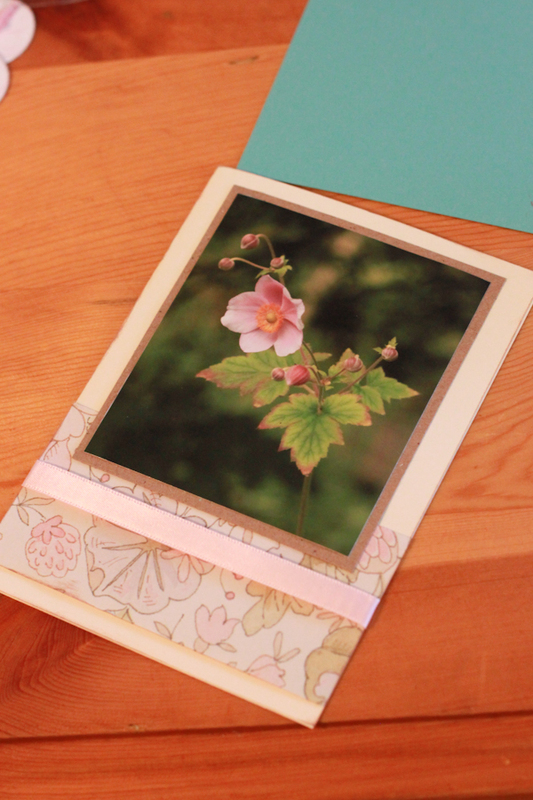 I also like to use a pigment pad to ad some color/a weathered look on the edges of the card.